This month, we brought you a series of reports looking at the road ahead for solar power in the Lone Star State. Texas is, of course, an historically oil-and-gas dependent state. home to the nation’s highest-producing oilfield in the Permian Basin. But as costs for solar installation have fallen, solar power investors from across the country and even the world have flocked to West Texas to cash in the region’s wide-open skies and endless summer sun, in what could amount to a new energy boom. 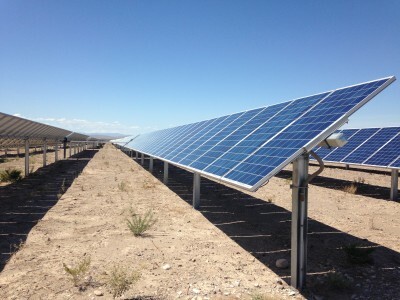 Just a quick glance at the roster of companies looking for tax breaks or other incentives to build solar farms in West Texas paints a picture of a budding industry: First Solar, Sun Power, Solaire Direct and Recurrent Energy are some of the major players poised to re-define West Texas economies, traditionally focused on ranching, agriculture and energy. Still, while the outlook is promising for this new industry, challenges remain. In Part I of our series, we learn that despite an industry seemingly jumping at the bit to move to Texas, lawmakers have appeared hesitant to provide solar companies with the kind of business-friendly incentives the state is known for. For Part II, we travel to the border city of Presidio, Texas, which has positioned itself as a model for energy sustainability in rural border areas – the kind that are often far-removed from the grid. “We were working off the old wooden poles that were put in about the same time they were filming Giant,” he says. That was in the 1950’s. Now, he says, with solar panels up at the local high school, the wastewater treatment plant, and a small-scale solar farm just outside of town, the city is putting more power back onto the grid than it’s taking off. Though rows of blue, shiny solar panels might be a new sight for many West Texans, the idea of renewable energy is not. In Part III of our series, we meet rancher Preston Fowlkes. His family’s ranched in the Big Bend region for generations. Family members past relied on windmills to draw water out of the ground – renewable energy of another time. But practicality and efficiency trump tradition, and Fowlkes is replacing his windmills with more reliable solar panels. Fowlkes isn’t the only West Texan looking to small-scale solar applications to make life in this rugged part of the country more sustainable. For our final report, we learn that despite some obstacles, solar is making inroads in the Texas energy market. One of the tell-tale signs: Recurrent Energy’s plans to build a 150 megawatt solar farm in West Texas. It would be the largest single solar plant the state’s ever seen. While the industry’s growth in Texas could help make the state greener – in environmental and economic terms – its success may prove a hardship for other industries. Larry Perea, a solar installer who works in Texas and New Mexico, says renewables are by their nature “disruptive” technologies. “It’ll be no different than the horse and carriage industry,” he says. If nothing else, Texas’ rapidly-growing population is likely to put dollar signs in the eyes of solar companies and utilities looking to cash in on growing demand for affordable, reliable electricity. This entry was posted in KRTS News and tagged Economics, Energy, Environment, Oil and Gas, Renewable Energy, Solar Power, Texas Economy, Texas Solar Challenge. Bookmark the permalink.